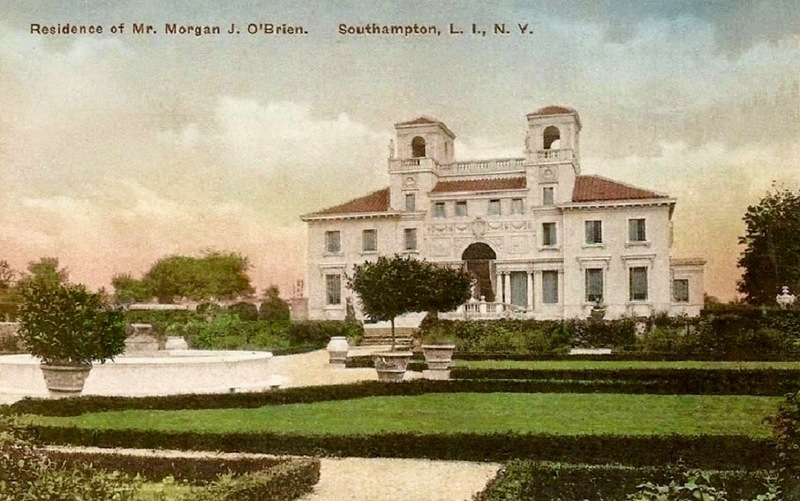 'Villa Mille Fiori', the Albert Barnes Boardman estate designed by Hill & Stout c. 1910 in Southampton and pictured here under the subsequent ownership of Morgan J. O'Brien. O'Brien and Boardman were partners in the law firm of O'Brien, Boardman & Platt. Click HERE and HERE for more on 'Villa Mille Fiori' which has since been demolished. Where did Boardman move after he sold this place? I'm curious to know what was the real size of the plot when Villa Mille Fiori was originally constructed? I read somewhere that it was 12 acres, but when I look at the historical aerial photography it looks like the estate occupies only the eight acres that are being currently offered for sale. Which is correct? I've seen both 10 and 12 acres listed as the size of the plot but in reality it was always 8 acres which is how the estate still exists today (sans the house, of course). I realize it's been a couple of years, but thank you for the answer regarding the acreage question!